Before work on your Miami Area Popcorn Removal can begin it is necessary to create a walking path from the work vehicle to each of the rooms to be worked in. The process of removing popcorn ceilings creates a mess that easily spreads to other areas and outdoors! To ensure the home remains clean we cover all floors in every area of the house that will be passed through. Removal of the Acoustic-Popcorn Ceiling begins with applying water to your ceiling. This is done with an airless spray rig that sprays warm water evenly over the ceilings. When the water has soaked into the ceiling the process of scraping begins. This is done by hand, atop a ladder, scaffold, or lift as necessary. 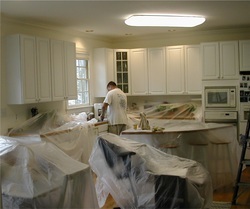 When the acoustic is substantially removed you will begin to see the results and beauty of this process. Often the ceiling has been slightly damaged in the process. Repairing the sheetrock, recoating the joints, and smoothing out uneven areas is the final step in the removal process. With the popcorn gone you will see a noticeable improvement! 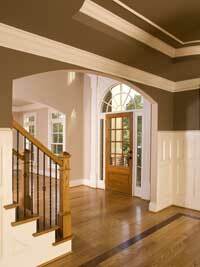 If you want a smooth ceiling your project will require skim-coating. This is the process of applying a thin layer of compound over the ceiling and then sanding it smooth. With your ceilings textured or skim-coated, all there is left to do is prime and paint! Visit the gallery to see the results of a popcorn removal job. Why should I remove my old popcorn ceilings? Brighten Up Your Home - The acoustical finish traps more than sound, it also darkens a room!